Home > Event Details > Celebrating Chinese New Year!! ▶Details: Top up ANY amount during the event period, when the specific number of top up player is reached, all players who take part in this event will win attractive prizes. 1. Multiple top up on ONE character will still be counted as one entry. 2. Any amount of top-up including weekly or monthly card purchase! ★Any Lucky Pack given after 3rd February 2019 00:00:00hrs (GMT+8) will not be taken into consideration. ★Top 10 winners have to claim the rewards via in-game event page by 3rd February 2019 23:59:00hrs (GMT+8). ★Unclaimed prizes will be void after 3rd February 2019 23:59:00hrs (GMT+8). Lucky pack system allows players to send/receive lucky pack during the event timing. Lucky pack is a monetary gift which is given during lunar new year holiday where it symbolizes good luck and is a symbol to ward off evil spirits. 3. Select the total amount of diamond, select the total number of lucky pack you wish to distribute and type your lunar new year greetings. 6. When a player grabs a lucky pack, they will get a chance of getting 1~100 diamonds. Once the total number of lucky packs is fully received by players, that lucky pack will disappear. 7. Each lucky pack will last for 24 hours, remaining diamonds not claimed by any player will be void. 8. One player can receive a maximum of 100 diamonds for the lucky pack per day. *Please note that all Adventure Medal will disappear once the event ends! *Please note that all Golden Star will disappear once the event ends on 2nd February 2019 23:59:00hrs (GMT+8). ▶Details: Use Adventure Medal to redeem attractive items! *Please note that all Adventure Medal will disappear once the event ends on 6th February 2019 23:59:00hrs (GMT+8). ▶Details: Use Latern to exchange items! ▶Details: Use Adventure Medal to exchange items! 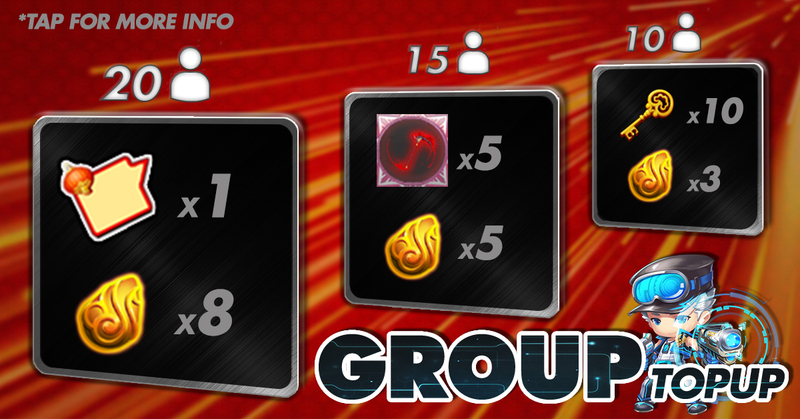 ▶Details: Exchange Gem Stone to make your character’s stronger! ▶Details: Use secret key to spin treasure to get Lv.60 Equipment.